In the summer of 2017, I was presented with the opportunity to conduct an independent research project in the Pine Barrens of southern New Jersey. I had won a project grant from my school with a proposal I drafted to study fish species distributions in Pine Barrens watersheds. I had read about the Barrens for years, and although its ecology fascinated me, I had never had the privilege of actually visiting, despite living in close proximity to it almost my entire life. 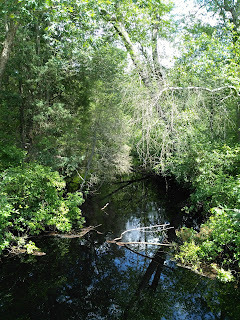 The Pine Barrens is a large expanse of coastal plain stretching across more than seven counties of southern New Jersey, isolated from the rest of the coastal plain habitat farther south. Its nomenclature refers to the area's sandy, acidic, and nutrient-poor soil. For this reason, the Pine Barrens has a unique ecology that supports an aquatic environment. Several species of fish have ranges in New Jersey primarily restricted to the unique ecosystem of the Barrens. 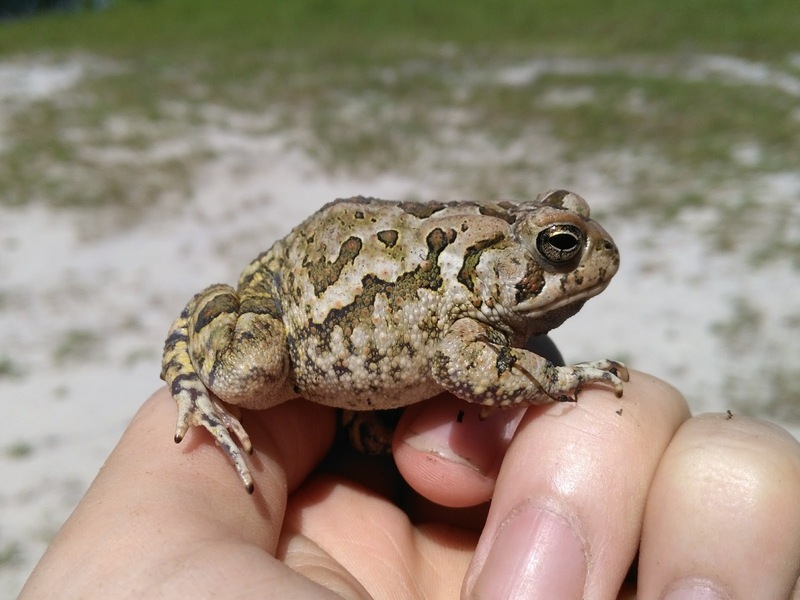 Of course, what this project in the Barrens allowed me to do was sneak in a little time for species hunting for those less common species. My primary interests were the sunfish of the Enneacanthus genus and Acantharchus pomotis. 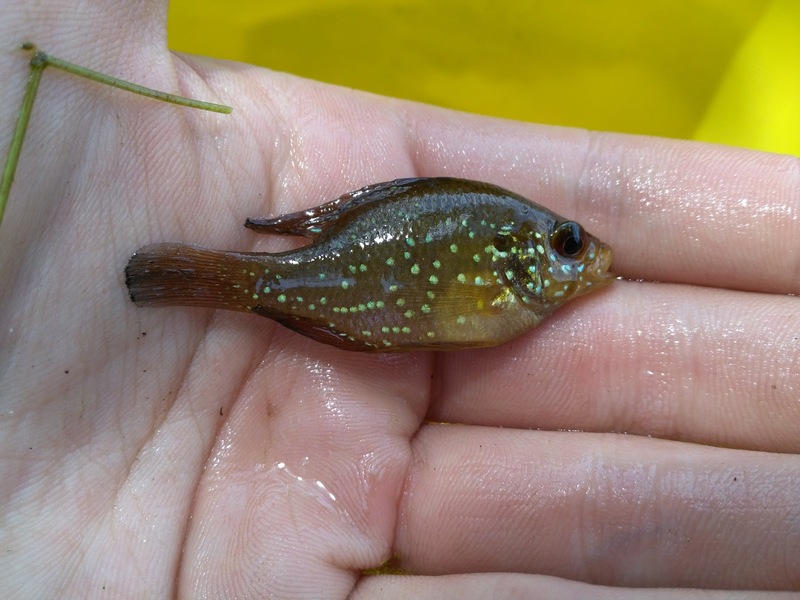 These smaller sunfish species, namely the bluespotted, banded, blackbanded, and mud sunfish, have captivated me for years with their beauty and proximity, similar to the Pine Barrens themselves. Also in the Barrens were several fish species which took less priority, as I expected them to be much harder to catch: these were the pirate perch, redfin pickerel, and eastern creek chubsucker. So the sunfish remained my primary targets. Upon finding myself in the Barrens for the first time, it was everything I could have imagined and more. The landscape was in fact quite alien, in a beautiful way. 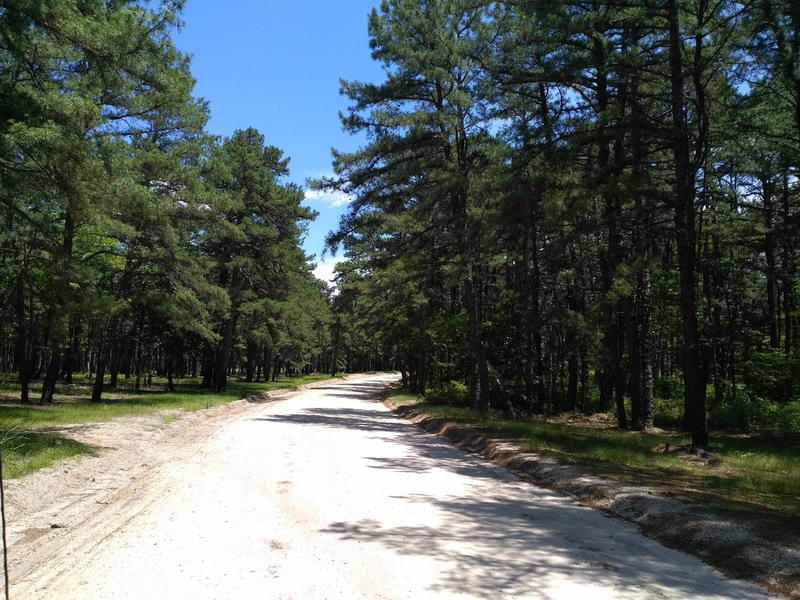 Sand roads crisscrossed the pine forests; in places it was tough to get the minivan across. I particularly found the tannin-stained blackwater fascinating. It was only a matter of time before I could drop some lines in pursuit of new species. But first there was work to be done. With that aside, I settled on a single location I had surveyed earlier in which I knew all the four target sunfish were present. I only had about an hour of daylight after a long day of work, so I set myself upon the water fairly quickly. The first fish came quickly. I was fishing a tanago hook with a nub of worm close to shore, and by that I mean no more than several inches from shore. 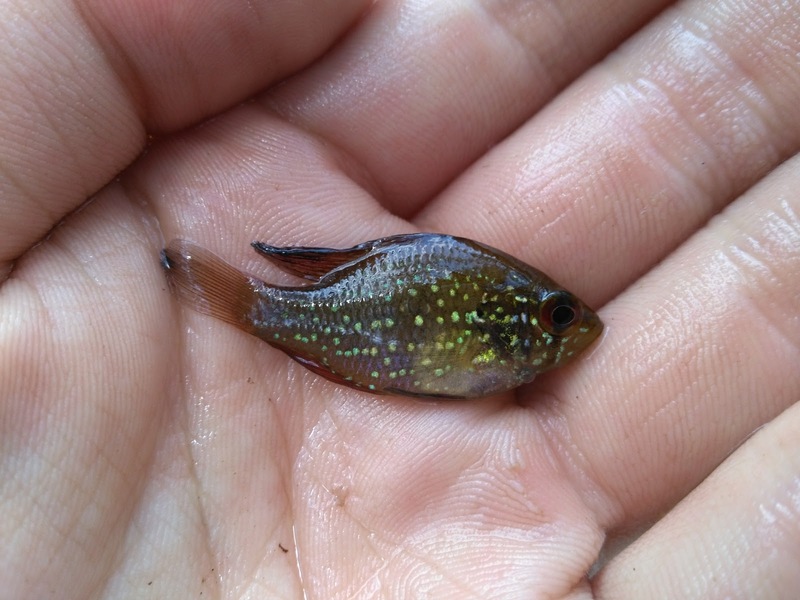 I dropped my line by a slightly undercut bank, and lo and behold, a sunfish popped out. A couple jiggles of the bait were all it took for the fish to commit, and I had species #95, the banded sunfish (Enneacanthus obesus). Originally, I had thought this fish to be a bluespotted sunfish, but upon returning after the trip, I looked through my photos and realized I had caught a banded sunfish. The key identifier here was the shapes of the light facial markings: bluespotted sunfish would have more prominent dots, whereas banded sunfish have more crescent and line shaped markings, as shown in the fish above. 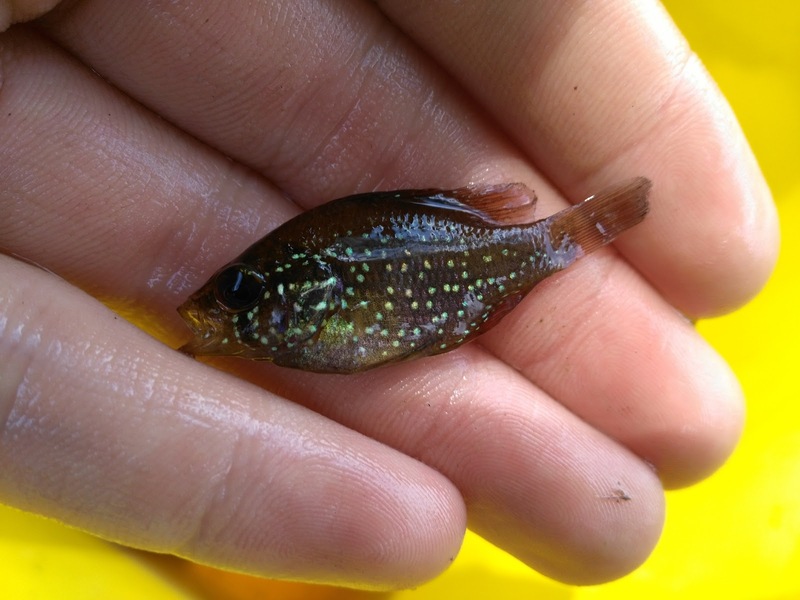 I was then treated to a handsome bluespotted sunfish in actuality: Enneacanthus gloriosus, species #96. 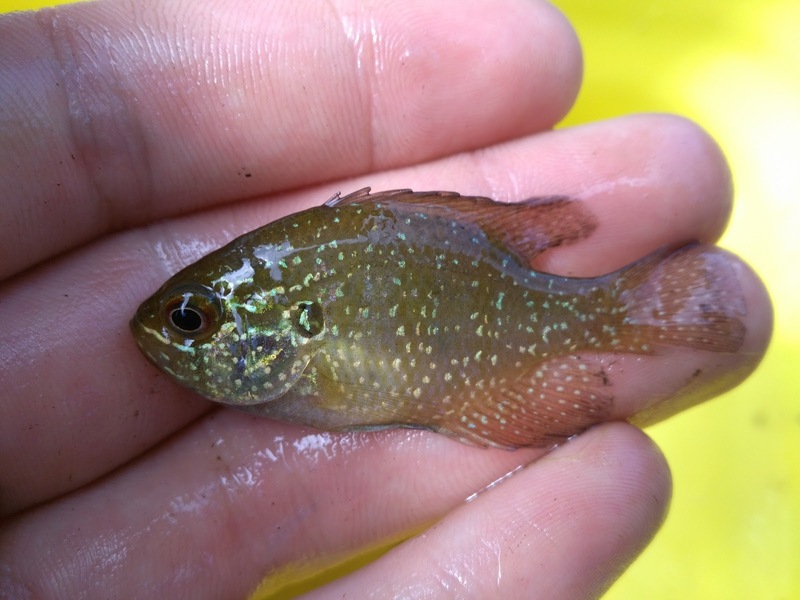 I also caught plenty of more drab female bluespots, convinced that they were banded sunfish and I had caught both bluespotted and banded. They proved to be female bluespots, however, and I was upset I failed to catch the banded until the realization came that my first was a banded. The blackbanded sunfish was the tricky one. The final Enneacanthus species, it was also the smallest, and I could see it darting in and out of the weeds in the shallow water near shore. 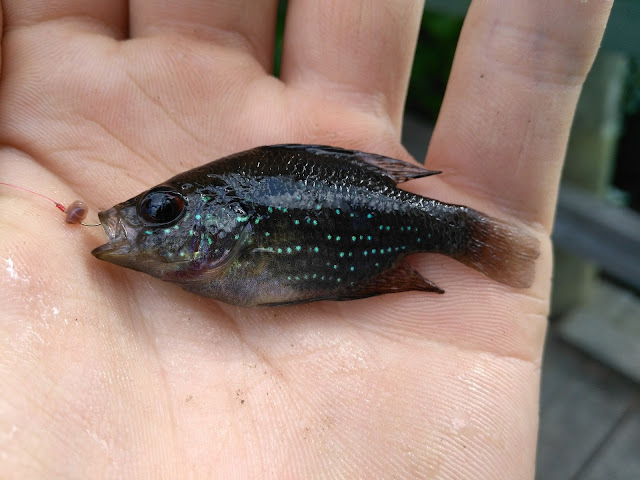 Before fishing however, I had the opportunity to read this: the story of another lifelist angler's experience with catching blackbanded sunfish. 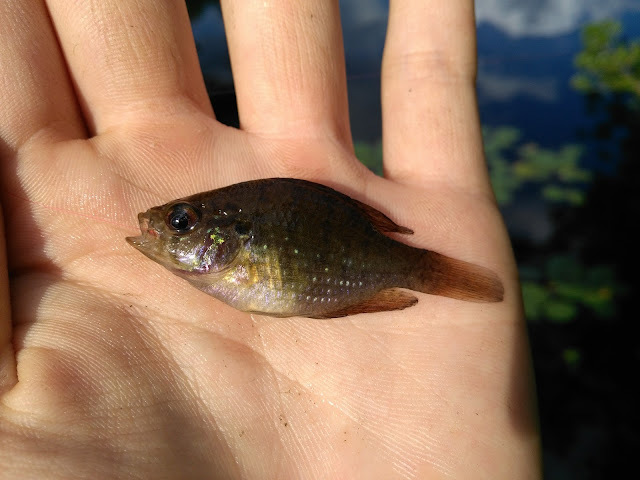 I can say that the total number of people who have caught this species can be counted on one hand, but this guy had a specific recommendation for the technique used to fish for these skittish, small sunfish. To sum it up, it was basically moving the split shot much farther up the line, so the bait would have a more natural presentation of free-falling in the water, rather than the jiggle motion which the other species would react to. Being snubbed by the blackbanded sunfish, I decided to give this technique a go. 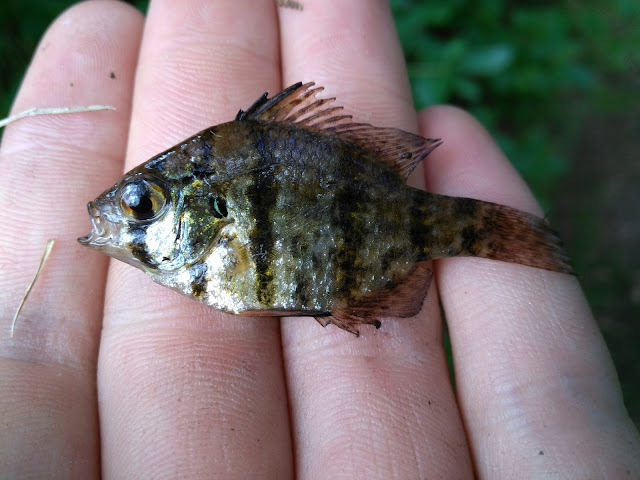 On the first try, I watched as a blackbanded sunfish slowly approached the bait as it slowly dropped, and nonchalantly sucked it in. I set the hook, and the fish promptly came out of the water and into my hand. A success! Species #97, Enneacanthus chaetodon. I had caught all three Enneacanthus species in less than an hour!, which I was fairly excited about. One target had not been caught: the mud sunfish. It was not to be, however; I ended up hooking one, but it came off the tanago hook as daylight faded. Curiously enough, I also hooked a very large chain pickerel, around 18-20 inches, on the tanago hook. It snuck into shallow water, almost motionless, and very gently ate the bait. It snapped the line, as was to be expected with the hair-thin filament snelled onto the hook. The Enneacanthus had been conquered, but one more sunfish remained. 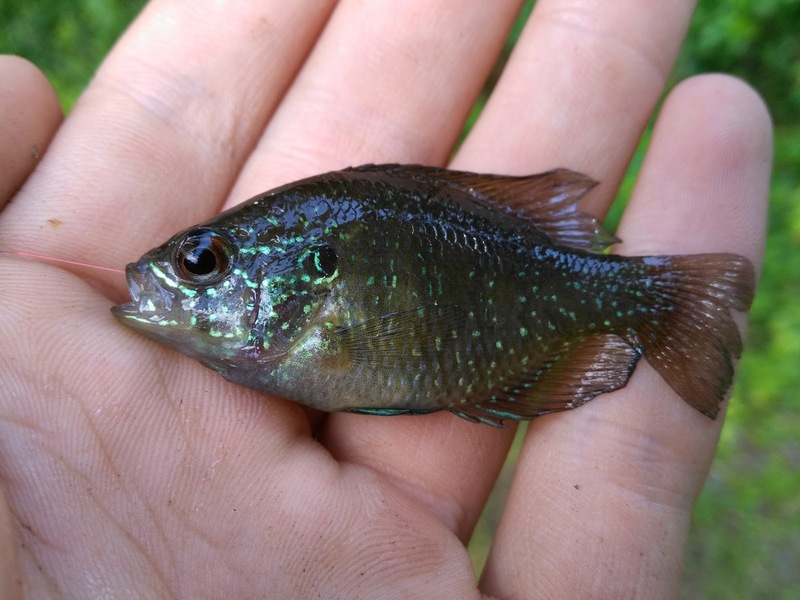 I would be back in subsequent months, as my project needed to be done over time, so I did not feel that missing the mud sunfish was too significant of a loss, especially given the short time frame allotted. Here are some various pictures from my project (fish not caught by hook and line).